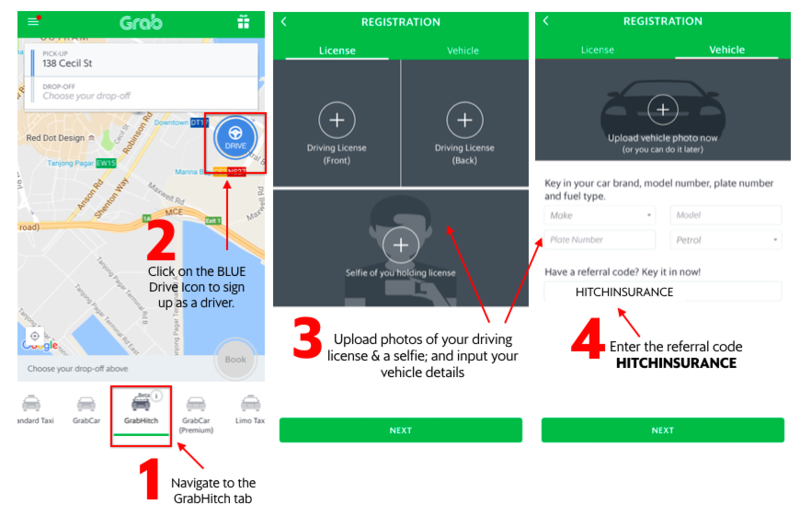 Social Ride Sharing with GrabHitch! GrabHitch is a non-commercial social travelling platform that matches you with people who are going along the same route. Tompang people who are going along the same way, recover petrol costs and who knows, the next passenger that you pick up might even be your next potential client! You MUST enter your referral code HITCHINSURANCE to get your $50 credit after you completed your first GrabHitch ride as a GrabHitch driver. Your application will be approved in 1-2 business days and you can start GrabHitching! Please fill in your details below so that we are able to verify your details to be eligible for the incentive. If you are not a Insurance Agent, you can still sign up with us as a GrabHitch driver! From now until the end of December, sign up with the referral code KAMPUNG20 and get $20 credit in you driver wallet upon completion of your first Hitch ride! This promotion is only eligible for Insurance Agents who have not signed up with GrabHitch as a driver previously. The RNF Registration Number provided needs to tally with the driving license details provided during the driver application process to qualify for the signup incentive. This incentive is only eligible for new drivers who sign up and successfully complete 1 Hitch ride as a driver between 19th October 2016 @ 00:00 hours – 31st December 2016 @ 12:00 hours. New drivers must sign up with the referral code HITCHINSURANCE in order to qualify for the $50 credit incentive. The processing of the $50 credit incentive will only be conducted after the incentive period has ended (post-31st December 2016). Please allow up to 10 working days for the crediting of the $50 incentive into Hitch driver wallets.